This is Anfield," the boisterous Liverpool stadium tour guide announced to us, pointing at and reading from the famous sign board in the small and narrow tunnel that leads on to the pitch of the equally famous Liverpool Football Club stadium. "This is the legendary sign that tells you that you are about to enter the most hallowed football pitch in the world," he went on proudly. "All the great players that have played in this stadium have touched it. Kevin Keegan has touched it, Kenny Dalglish has touched it, Ian Rush has touched it, Steven Gerrad has touched it, David Beckham has touched it, Cristiano Ronaldo has touched it, Luiz Suarez has touched it. Just think of all the great players that have played in this stadium and they have all touched this sign. Probably the only player that has not touched it is Peter Crouch. He kissed it!" 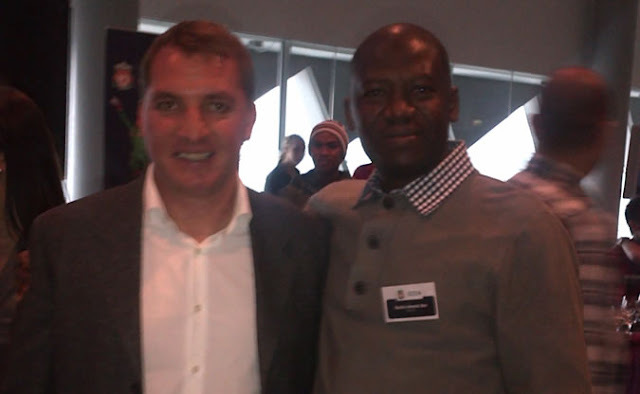 That moment for me was the highlight of the Liverpool stadium tour that we undertook on Monday, May 20, 2013. By "we", I am referring to the 10 football teams from around the world that converged in Liverpool to participate in the 2nd Standard Chartered Bank Trophy Final tournament, tagged "Road to Anfield." The stadium tour was part of a very busy four-day itinerary culminating in the 5-A-Side football competition that was played on the "hallowed" Anfield pitch. I had been looking forward to touching the "This is Anfield" board myself and I was not going to miss the opportunity. Since I started following Liverpool in 1977, I had always been fascinated by the imaginary sound of those three words each time I saw them in the Shoot and Match football magazines of those days, and later on television when I started watching the Reds. I thought the message was simple but audacious: "This is Anfield." I loved it and still do. The stadium tour took us to the home players' dressing rooms and we sat on the red benches that the likes of Rush, Gerrard, Graeme Souness, John Barnes, and other Liverpool greats would have sat while listening to pre-match or half-time team talk. We also visited the away team's dressing room and sat on red benches that our own Austin Okocha, Daniel Amokachi and Joseph Yobo must have sat while visiting to play against Liverpool. From the dressing rooms, we went through the narrow tunnel and into the stadium where we again sat in the teams' dug-out from where the likes of former Liverpool managers Bill Shankly, Bob Paisely, Kenny Dalglish and Rafael Benitez shouted instructions to their players to win the tons of trophies the club has won. One remarkable thing about the Liverpool dug-out is that it is just one dug-out for both the home and away teams! Both sets of seats are only separated by a narrow passage and either manager could hear his rival plan strategies with their assistants if he paid attention. As we sat there, I could imagine Sir Alex Ferguson eavesdropping on Benitez and current Liverpool manager Brendan Rodgers! No wonder Manchester United has succeeded in knocking us off our perch, as Ferguson put it. The old fashioned Anfield dug-out is the best illustration of the stadium's out-datedness, if you ask me. Originally built in 1884, the Liverpool stadium cannot compare with many modern stadia around the world that I have visited. In fact, the stadium is no longer good enough for a club of Liverpool's stature and pedigree and I was quite disappointed by the overall look and feel. If the Liverpool hierarchy are reading this, it is a loud protest by a loyal fan not happy with the state that he found the home base of his beloved club! Our tour guide was frank enough to admit that the 42,000-plus capacity stadium was no longer adequate for a big club with a huge fan base like Liverpool, which corroborated my feelings. "Many of the seats in this stadium are old and made from wood and they are quite uncomfortable to sit on," he said. Obviously, the club owners and the management hierarchy seem to realize that Anfield is no longer befitting of the club and the talk of building a new stadium has been on for some time. Liverpool managing director Ian Ayre told me at a press conference earlier about the challenges the club was facing finding land to build a new stadium. At the moment, the northern part of Liverpool where Anfield (as well as Goodison Park, home ground of Everton FC) is situated is considered as the most run-down part of the city. Compared with the rest of the city, you would think you were in an abandoned territory. The condition of Anfield and its surroundings have not dampened the spirits of the club supporters, however. On Sunday when we went to watch the last English Premier League match of the season between Liverpool and Queens Park Rangers, the stadium was packed to the rafters and the fans on the "wooden uncomfortable seats" didn't seem to care. Not surprising, as Liverpool have always been known to have some of the most loyal supporters in the world. As the players filed on to the pitch through the narrow tunnel (after most of them would have touched the "This is Anfield" sign, I guess), the fans exploded with the rendition of the club's famous anthem, 'You'll Never Walk Alone'. As usual, the singing was led from The Kop end of the stands which is the shrine of the Liverpool Supporters Club. As the rest of the stadium joined in the singing, you could feel the ground shake below your feet. Many players, home and away players alike, have confessed that the passionate manner the Kop sings is something special. Arsenal legend Thierry Henry is quoted in The Anfield Songbook as saying: " Liverpool's fans are just amazing. The best feeling I have at away games is Anfield. It is just incredible. I love it. You get goose bumps when you see their supporters sing You'll Never Walk Alone." Last Sunday, I experienced the feeling myself for the first time. I got goose bumps like Henry. Besides, it was a special occasion last Sunday as Liverpool's long-serving defender Jamie Carrager was playing his last match for the club. Players from the two teams formed a guard of honour for him and he entered the pitch with his two young kids, a boy and a girl. Liverpool went on to beat Rangers 1-0 and Jamie nearly signed off in the best possible way when the fired a 30-yard thunderbolt which came off the crossbar in front of the Kop. Each time he touched the ball, he was greeted with applause. And when Brendan Rodgers pulled him off with five minutes remaining, the standing ovation lasted several minutes. One other player that received a loud applause was our controversial but immensely talented striker Luiz Suarez. He is still serving a 10-match ban for biting Chelsea's Braslinav Ivanovic, but when Liverpool fans saw Suarez in the crowd, the whole stadium started singing his praises: "There's only one Suarez, there's only one Suarez." I thought to myself: 'What? In spite of all that this guy has done? Always getting into trouble and bringing the club into disrepute?" Apparently, The Kop don't care. Suarez might well have bitten off and swallowed Ivanonic's ear! All they care about are the goals that the talented Uruguayan is scoring for Liverpool. With the kind of adulation and affection that Liverpool fans shower on their players which I witnessed last Sunday, I wonder how some players still manage to summon the courage to leave such a club. And now that we are talking about it, I understand fully why our captain Steven Gerrard couldn't leave a few years ago even when he was desperate for a Premier League title; why goalkeeper Pepe Reina is still around despite years of his speculated departure; and why Carragher played his entire career at Anfield. The supporters practically worship the Liverpool players. I spoke to Brendan Rodgers and he is confident that Liverpool will keep all its top players ahead of next season as well. "Our plan is to build this team, (and) make it more competitive, so we can't be selling our top players. We have made some progress this year because our points total and goals ratio have improved on the last four seasons. Our target next year is to finish in the top four of the Premier League and qualify for the European Champions League." It is 23 years now since Liverpool won the League title. In fact, we are yet to win the Premier League at all since it was introduced in 1992. During that time, we have watched helplessly as Manchester United reined us in and overtook us in the overall log table of top flight titles won. Even our little neighbours Everton have been rubbing salt in our wound by finishing ahead of us in the league in the last two seasons. Brendan Rodgers has just completed his first year in charge as manager and I like the playing style that he has introduced. With a bit more bite and aggression against the big teams; and consistency against the so-called smaller teams, I believe Liverpool will soon be contesting for honours again and not living on the past glories of Shankly, Paisely, Dalglish and Benitez's Istanbul! PENULTIMATE Wednesday, I asked readers of this column to predict the score of the UEFA Champions League Final between Bayern Munich and Borrusia Dortmund coming up this weekend. Already, several entries have come and are still coming in - you can still be part of the fun. As I promised, TWO copies of Segun Odegami’s latest book as well as 10 copies of Jibril’s book on Rashidi Yekini will be given to 12 readers with correct predictions. But if there are more than 12 correct entries, there will be a lucky draw. Please note, however, that entries close by midnight on Friday, May 24, 2013. "Some say football is not a matter of life and death; I can assure you, it's much more important than that" -Bill Shankly. Congrats on your successful pilgrimage. Your impressions about Anfield merely confirms the significance of that venue as a cradle of the English game. With due respect to the other "big clubs" in England, history bestows relevance on 2 clubs as the bastions of the English game: Liverpool and Manchester United. If Old Trafford is 'The Theatre Of Dreams', Anfield is the 'Shrine of Miracles'. Anfield echoes the timeless words of its most revered custodian, Bill Shankly: "Some say football is not a matter of life and death; I can assure you, it's much more important than that". The challenge facing Liverpool over a befitting venue is to balance the expectations of commerce with the demands of tradition. Abandon "the out-dated" Anfield? And with it, the echoes of Shankly, Paisely, Dalglish, and The Kop? Whatever happens, it seems almost certain Anfield is not going to remain unchanged in the future. By the way, my romance with Liverpool began 1977 with the European champions of Kevin Keegan, Ray Clemence, John Toshak, Ray Kennedy, Jimmy Case, Emilyn Hughes, Ian Callaghan, Phil Thompson, David Fairclough, etc. Whether Liverpool win any more trophies or not, the history and tradition are for eternity. @Ada Orile.You must have been a fly on the wall at Anfield. While conducting us around, the tour guide kept repeating that "we (Liverpool) are the most traditional club in England." I wasn't impressed, because it was clear he was just using that justify some of the archaic fittings in the stadium. One example: The players' dressing rooms have no lockers! We (the tourists) didn't complain, but the guide went on to say Shankly wanted it that way. Fact is, if they put lockers in those tiny rooms now, there will be no place to walk! This, though, is not a quarrel with your points of view, Ada. I just wish to emphasize that Anfield desperately needs an overhaul. Man U are also a 'traditional' English club as you rightly said, but Old Trafford which I've also visited is streets ahead of Anfield. Finally, what a nice coincidence that you started following Liverpool the same year as me. Perhaps it's not a surprise anyway because that is the year that we first made our mark in Europe. It was also the year, I think, that the legendary Kenny Dalglish first arrived. Now, more than ever before, I'm curious to know the face behind this prolific "Ada Orile" who happens to be a Liverpudlian like me. You'll Never Walk Alone. I have been a virtual acquaintance of you ever since Oga Sunny Obazu Ojeagbase launched Sports Souvenir which later metamorphosed to Complete Football. Your writing style was the draw for me: simple, candid, and very Nigerian. Your sobriquets resound with the indigenous Nigerian soccer fan: "Ye-King", "GoalsFather", "HeadMaster", etc. I 'know' about Kayode Tijani "stealing" your back issues of Shoot. By the way, my rich library of Shoot magazines might well have rivaled yours, before rain and termites invaded my rusty trunk. I 'know' you once lived in Enugu; incidentally the same city of my formative years. I 'know' you support 3SC; I support Enugu Rangers. When the stories of derbies are told, history shall remember the mother of all Nigerian derbies: October 14 1977 and October 28 1977; Semi-Finals 1st & 2nd Legs of African Cup Winners Cup at Suru-Lere and Ahmadu Bello Stadia respectively. Curiously, I bet on Shooting Stars to triumph because they had a better team; I lost the bet, and I have never bet against Enugu Rangers ever since. I followed you, Paul Bassey, Ose Osayedian(?) (the guy from Weekend Concord) on NTA 10. I still think your best piece of writing was on Complete Football on the 1994 International Friendly between Nigeria and England at Wembley: "Permission To Land, Not To Win". The day shall come when Nigerian football shall acknowledge your immense contribution towards Nigeria's debut at the W/Cup in 1994. Indeed, as a soccer fan appalled at the current derelict state of Nigerian sports writing, I steadfastly refuse to applaud the current migration of our seasoned sports writers to the executive suite. Why? For the simple reason that Nigeria sports is off worse. Sports writers are born to write, after all. I've been to Anfield once as a teenager when it was the mecca of football, in the era when Liverpool were kings. I visited Complete Sports modest headquarters at Isolo in 2001 to present a proposal on a soccer comic strip narrating the recent history of Nigeria football (1970-2000). It was supposed to run on the bottom corner of the back page of each edition of Complete Football newspaper. Football has evolved all through my romance with this beautiful game, and that is the reason I am not discouraged by the contemporary commercial and sporting failures of my beloved Liverpool. My Arsenal and Chelsea buddies don't get it: there is more to this game than trophies. But time determineth all things, we are told. Anfield shall certainly be overhauled, and not a small part of some of us shall die with it. Oga Mumuni, You'll Never Walk Alone.